Justus T. McCann is a native Oregonian, who was born in Seaside, Oregon and grew up in the small coastal town of Manzanita. While attending the University of Oregon for both his undergraduate and law school educations, Justus McCann was a member of the U of O Cheerleading squad, a founding member of the Pi Kappa Phi fraternity and played for a local semi-pro football team. After graduating from law school, he moved to Las Vegas, Nevada, where he practiced as a Partner with the prestigious law firm of Koeller, Nebeker, Carlson & Haluck, LLP. Mr. McCann was a well-respected attorney in Las Vegas practicing primarily in the area of complex construction litigation. 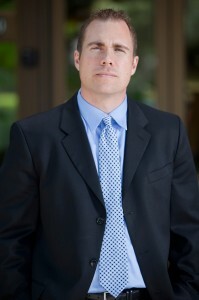 Wanting to return to the Northwest, he relocated back to Eugene, Oregon founding the Law Offices of Justus McCann, LLC. Mr. McCann practices in the areas of Civil Litigation, Family Law, Estate Planning, Business Law, and Mediation. Mr. McCann is admitted to practice in Oregon, and is an inactive member of the Nevada and California bars. When he is not assisting clients with their legal needs, Mr. McCann enjoys spending time with family and friends, playing sports, supporting the Oregon Ducks, and enjoying the outdoors.